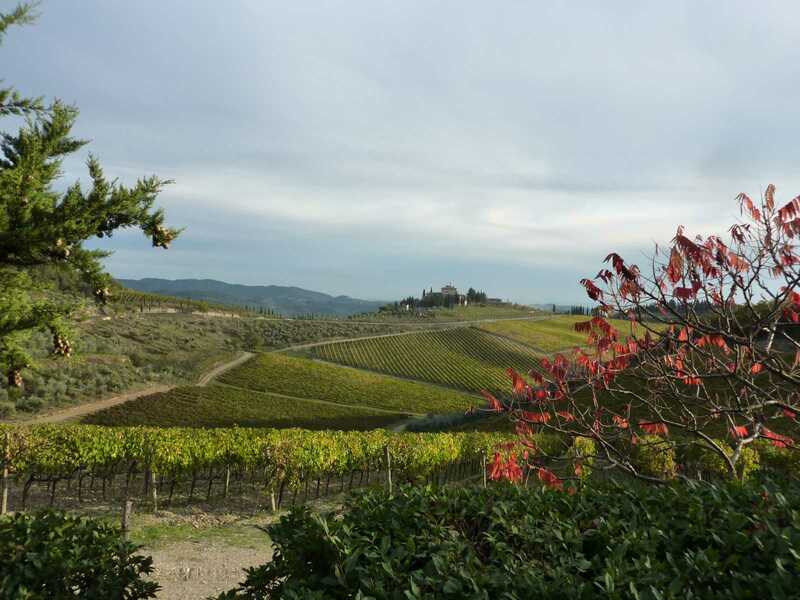 November is the official start of our less busy season at Bike Florence&Tuscany. Carney, Dawn, Robert & Kurt, even if a little bit worried about a possible rainy day, decided some time ago to book their private San Gimignano to Siena in November. Actually, this year we are having lovely, sunny fall days in Florence&Tuscany. Out in the countryside, after the Sangiovese grape, the harvest is still going on: it’s now the turn of olives, it is time for the delicious Tuscan extra-virgin olive oil! Joining the party and relish this unique atmosphere is absolutely amazing. The air is saturated with the aromas of wine fermentation, musk, mushrooms and olive press. Fall colors are in full swing, warm and intense. Autumn in Tuscany is simply magical! After the visit to San Gimignano, we move quickly to the starting point and begin to bike, plunging into the landscape you have always dreamt of and be part of it, on a scenic ride through the most spectaculars hills of the Chianti region. Fall has always been my favorite season. The time when everything bursts with its last beauty, as if nature had been saving up all year before resting during the winter period. On this warm, sunny November day our eyes are dazzled by the gorgeous images flowing before us cycling through these sweet slopes, lines and colors of Tuscany, the medieval villages, the castles, people working the land. Our nose are delighted by the many different Mediterranean scents coming from the vineyards, olive groves, woods, and earth. The stop at Monteriggioni is also time for our wine tasting at ”La Cantinetta”. Seila, our wine expert, is pleased to teach us of wines, right pairing of Tuscan wine&local food, extra-virgin olive oil, so fresh pressed, to taste on site with real Tuscan bread. Afer this fun&greatly delightful experience, we enjoy ourserves with a delicious Tuscan panino – pecorino cheese and ham – eaten sitting at the square of this gorgeous, small walled castle, under the Tuscan sun! It is now time go back to bike some more miles, toward Siena, where this memorable adventure with our new friends is going to end. I will surely keep this superb day of November among my memories of this season for a long time! 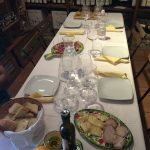 A great time happily spent with great companions on a relaxed ride thorugh our amazing countryside, wineries,vineyards and the most beautiful Medieval Villages of the Chianti. The unusual quiet of the historic hilights of the day, which is typical only of this period ot the year, has contributed so uniquely in combining fun, cycling&wine tasting at slow pace with our usual so condensed itinerary. Fall is nothing but perfect… welcome fall! Indeed, our bike trip with Piero and Elena was one of the highlights of our 10 day trip to Italy. After 8 days touring the ancients sites of Rome, Pompeii and Florence, we took the San Gimignano to Siena tour and were pleasantly surprised. We were able to bike at a comfortable level through a lovely countryside, see two wonderful medieval villages, enjoy a wine tasting and lunch and finished in Siena. The tour was a refreshing breath of fresh air and Piero and Elena were fabulous! I highly recommend this trip to anyone considering a trip to Italy. We were able to enjoy Italy with a different perspective from our previous days. A must do if you have any interest at all. We were all very pleased!! !